Poké (poh-kay) is a traditional Hawaiian street food that is a healthy alternative to western fast food. It’s a combination of diced raw fish, vegetables and various other mix-ins. Poké in Hawaiian translates as ‘chunk’. It has been compared to a deconstructed sushi bowl, with hints of Asian flavours which creates a unique, healthy and soulful alternative to an everyday salad. We’re sure you’ll love our fresh Poké! 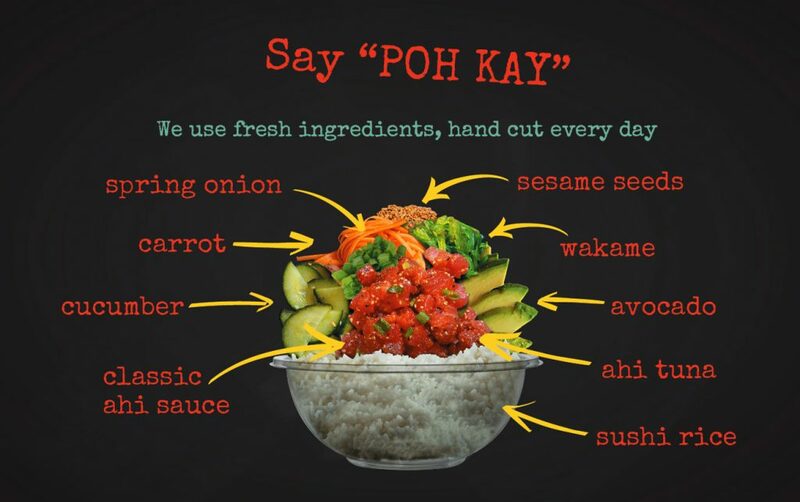 We believe that everyone deserves to enjoy the fresh and unique taste of Hawaiian Poké. Our dream of bringing this incredible food to Manchester has finally come true. Poké is a cuisine that we love and want to share with our home town, Manchester. Oké Poké will offer all of the original ingredients of Poké, however, we offer vegetarian and some gluten free options. That way, everyone can experience the incredible Hawaiian soul flavours of Poké. We are passionate about reducing environmental waste. Almost, all of our packaging is made from biodegradable materials, sourced from Vegware. At Oké Poké we believe in providing our customers with fresh ingredients, sustainable fish and the highest possible quality ingredients to create a traditional island taste.